At the age of 56 -- she began her journey to obtain her high school diploma. Mary received tutoring from Sister of Humility Rose Doyle in her preparation. In 1976, after having been away from school for forty years - Mary received her high school GED diploma. She then enrolled at Palmer Junior College, where she was to [underlined] WHO'S WHO AMONG AMERICAN JUNIOR COLLEGE STUDENTS. [/underlined] At the age of 60 -- Mary graduated from Palmer Junior College with an Associate of Liberal Arts College Degree. In the early 1960's Mary was instrumental in getting out the Latino vote with the VIVA John F. Kennedy Campaign. 1969 Mary organized the welcome reception for the initial Q-C visit by Cesar Chavez, Leader United Farm Worker Union 1970 - 1978 Mary was a member of the Mexican-American Committe on Education for Davenport School System. 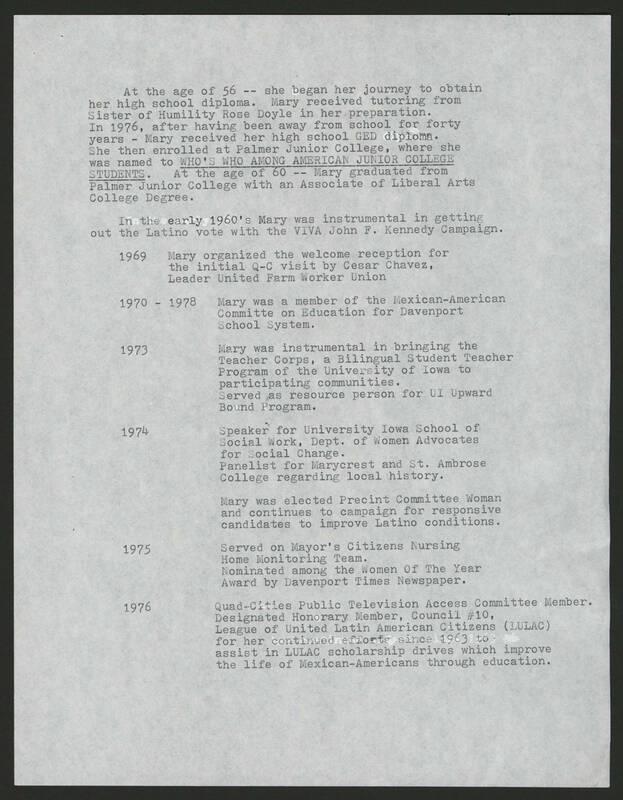 1973 Mary was instrumental in bringing the Teacher Corps, a Bilingual Student Teacher Program of the University of Iowa to participating communities. Served as resource person for UI Upward Bound Program. 1974 Speaker for University Iowa School of Social Work, Dept. of Women Advocates for Social Change. Panelist for Marycrest and St. Ambrose College regarding local history. Mary was elected Precint Committee Woman and continues to campaign for responsive candidates to improve Latino conditions. 1975 Served on Mayor's Citizens Nursing Home Monitoring Team. Nominated among the Women Of The Year Award by Davenport Times Newspaper. 1976 Quad-Cities Public Television Access Committee Member. Designed Honorary Member, Council #10, League of United Latin American Citizens (LULAC) for her continued effort since 1963 to assist in LULAC scholarship drives which improve the life of Mexican-Americans through education.